My husband always says that I have a tendency to buy too much fruit, it's true and I don't know why I pick them compulsively and then end up with ripe fruit screaming for help. This week, I had over ripe bananas sitting on my counter so that gave me an excuse to bake, and yes, I do need excuses to justify my passion. So naturally, my choice fell on chocolate banana cake. The cake is amazingly delicious, with a deep chocolate flavor. I also want to share with you some photos I took on a day out with my best friend that came from Lebanon to spend a week with us. She had already came to Paris many times, but it was her first fall here, it was actually a chance to experience a unique view of the city. It was so beautiful and peaceful, everything was shaped up to form a spectacular autumn season. The sky has been mostly blue, the brightly colored crisp autumn leaves rustled with a great noise as we walked, the air was crisp but still pleasant, and the scene was truly amazing!!! Beurrez un moule à cake et placez-le sur une plaque à patisserie. Tamisez la farine, le cacao, la levure, la bicarbonate et le sel. Dans un saladier, battez le beurre 1 mn. Ajoutez les sucres et battez 2 mn. Ajoutez les œufs, un à un, en battant après chaque ajout. Ajoutez la purée de bananes puis versez le mélange de farine tamisée en 3 fois, en mélangeant après chaque ajout. Ajoutez le lait ribot et mélangez. Incorporez les pépites de chocolat et versez la préparation dans le moule. Enfournez pour 30 mn. Faites-le sortir et couvrez-le avec du papier aluminium. Enfournez de nouveau pour 40 mn de plus. Laissez-le refroidir complètement avant de couper. Love the nature photos! Autumn is so beautiful everywhere. The banana cake looks yummie! That cake looks so moist and delicious! I love your fall pictures. aïe aie ça j'adore , chocolat et banane !!! So beautiful. It looks so moist and so yummy! 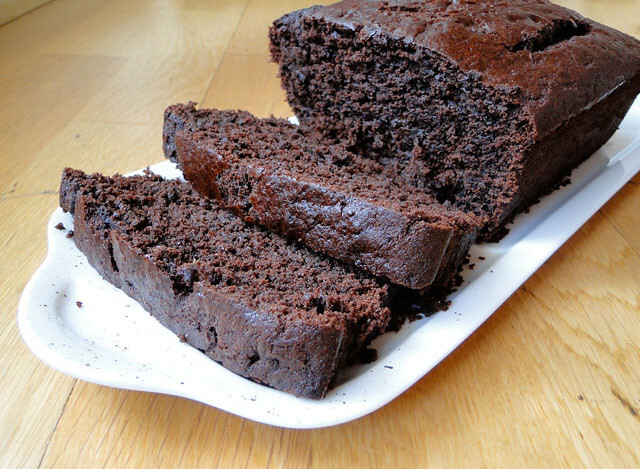 This cake looks so moist, is it really dense and chocolaty or is there lightness from the banana? Beautiful fall photos! And, the cake looks delicious. I'd like a piece for breakfast, please! Love fall clicks. Nice cake looks moist and delicious. This banana choc cake looks amazing! One of the few breads that my husband likes is banana bread, and he looooves anything chocolate so I will definitely have to make this for him! Hopefully I won't eat too much of it though! Your photos are stunning and the cake looks delicious. You have a wonderful blog, keep up the good work. les photos sont très alléchante ! One cup of cocoa powder makes for a very chocolaty cake! ce cake a tout pour me plaire! Tes photos de la France en automne sont splendides, du vrai travail de professionel. I'm sure you make your husband happy with your cakes! Those Autumn pictures are stunning beyond words. They should be framed. Cherine, Your cake looks absolutely mouth-watering. Glad you have a good time with your friend :) Beautiful nature photos! That looks so dense! I can definitely see that dark chocolate intensity from the image. Those pictures are beautiful. What park is that? Post more! Who wouldn't want to see Paris in the fall? Bnana cake! that calls my name! what a great fall treat and your picutre is so lovely. Cherine, your photographs are amazing, really capture the season beautifully. The bread looks moist and delicious. The fall photos are absolutely stunning!!! Beautiful photos of the leaves!! The cake looks good too, of course. =) We always end up with way too many overly ripe bananas - bookmarked! Just made the chocolate banana cake... Delicious! Thank you for the recipe! Thank you very much for this recipie - one of the men at my work turned 60 on Thur so I said I would bake a cake - his favirote a chocolate banana cake, one I've never made and so I came across your recipie. It has turned out so nice and very tasty. I will be adding this to my collection for the next time its requested :-) Thank you from New Zealand.